The Constitution of India established a Union of States with a federal structure. It gave a lot of politico- economic autonomy to the state governments according to a well-defined division of power between the latter and the central government. The Constitution did not allow for secession of any state - the federal content of the governance of India was otherwise in consonance with the diversities of caste, creed and customs that made India a cluster of different looking demographies needing a unifying political identity at the national level. The Constitution did not leave any ambiguity about interpretations of the words sovereignty and autonomy. My own experience of how important it is to keep this distinction intact could be recalled to prove the point. In 1994 when I took over as director IB there was a new level of escalation in J&K as the Pak ISI - enthused by the credit Pakistan got from the Americans for the success of the anti-Soviet armed campaign in Afghanistan - had planned to replicate the Afghan Jehad in the Valley and started pumping in Mujahideen from across the LOC. India was used to putting up with the pro-Pak separatists led by Jamaat-e-Islami Kashmir that harped on Plebiscite and handling the Valley parties which ran their politics clutching on the Hurriyat for support. Noticing that the offensive on the war cry of Jehad was making the separatists submit to the new kind of violence the Centre at that time tried to keep the Hurriyat in check by offering to discuss the issue of autonomy. The Centre understood that autonomy always fell short of sovereignty which led PM Narsimha Rao to even say that ‘sky was its limit’. J&K in any case had a Constitutional provision for it. Unfortunately the separatists have, down the years, shown up for what they always were a bunch of paid agents of Pakistan and need to be handled entirely on a different footing now. Pakistan, meanwhile, is not only stepping up its ‘proxy war’ against India -as the arrest by NIA recently of ten members of an inter-state terror module shows-but also enlarging its campaign for Kashmir into a narrative of injustice and mistreatment of the ‘twenty per cent of India’s population that the Muslims represent’. This is precisely what Shah Faesal, the IAS topper of Kashmir, said on return from Harward -where he claimed to have ‘learnt new things’ - before resigning from service to pursue a career in politics. Apart from cross border terrorism in Kashmir, Pakistan under Prime Minister Imran Khan is now fiddling with the Muslim minority of India to cause internal destabilisation in this country. Imran Khan is on record for saying that he looked forward to a resumption of dialogue with a ‘new government’ in India after the 2019 general election. The communal divide in India that had made the internal security here vulnerable in the decades after Independence, is being made an instrument of national politics in the name of ‘protection’ of Muslim ‘minority’. What should cause concern is that forces within and outside of the country are converging on this line of rhetoric. The run up to the next Parliamentary election and the period after that can witness domestic polarisation further tempting a hostile Pakistan to continue fishing in troubled waters here. ‘Cooperative Federalism’ needs to come into full play and for this the states must ensure that on the issues of Development and Law Enforcement- the prime secular responsibilities of a democratic dispensation, there was complete oneness in order to keep the nation united and strong. Unfortunately the trends of caste and regional politics seem to be not working for this and herein lies a long range threat to India’s integrity and domestic stability. While communal antagonism that India inherited as a legacy of partition was itself bad enough the rise of politics rooted in caste and regional centrifugalism has now come to stay in India and is on way to becoming stronger as the next general election draws close. India is the only country which has the concept of caste - it is different from colour or race- that defines a person's birth which meant that one could change one's religion but not caste here. Acknowledging the historical legacy of injustice done to groups now called Dalits and the tribes called Adivasis by way of untouchability and a forced social aloofness respectively, our Constitution laid down reservations for Scheduled Castes and Tribes and also recommended state support for socially and educationally backward ‘classes’. All this was supposed to be kept totally free of politics which in a democratic governance should be resting entirely on ‘one man one vote’. In a convoluted development however, an entire set of castes got enlisted for reservations- basically through Mandal Commission- under the label of socially & educationally backward classes without an attempt ever being made to exclude those from the ‘largesse’ who had totally been freed from ‘backwardness’. The play of political vested interest in all of this has gone on because Indian democracy has become a captive of ‘vote banks’. This is not difficult to understand. A distinct feature of India’s demography was that predominance of castes often corresponded to territory just as language also did creating a separatist ethos in the latter’s case. The socialist movement in India was rooted in anti-Brahmanism and non- Congressism which facilitated its shift into the hands of backward castes. The anti-Hindi agitation of Ramaswamy Naickar that peeked in the sixtees had become a separatist campaign against the North. The democratic processes of India could assimilate the Dravidian movement but the caste politics in the north continues to be self -sustaining and capable of grabbing power. 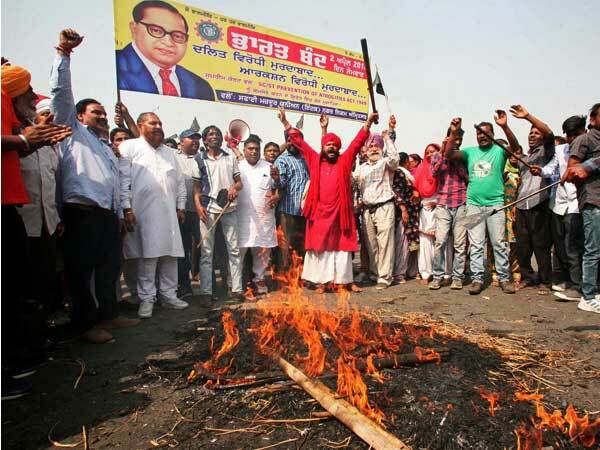 India has not moved towards becoming a society free of projections of caste and creed in public life and this can only weaken the nation from within. In retrospect one wonders if the linguistic division of states done in 1956 was as good an idea as it might have looked then to our policy makers. Language became an instrument of political consolidation and since language is an important vehicle of culture it also produced a ‘separatist’ ethos in the name of regional pride. A caste or language group in power in a state put other sections to disadvantage as favouritism and nepotism crept into governance. As the country heads towards a bitter and turbulent electoral battle this year thinking citizens are bound to recall the fragile rule of UF governments that followed the Lok Sabha election of 1996. India needs a politically stable government at the Centre whosoever might provide it because in the environ that prevails around India and the vulnerability that internal stability faces at present a strong Centre is the need of the hour. Indian masses fortunately have the intrinsic ability to vote for political stability and national security.